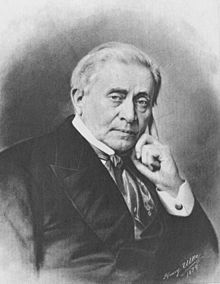 Joseph Henry (December 17, 1797 – Mey 13, 1878) wis an American scientist wha served as the first Secretar o the Smithsonian Institution. He wis the secretary for the National Institute for the Promotion of Science, a precursor o the Smithsonian Institution. ↑ "Planning a National Museum". Smithsonian Institution Archives. Retrieved 2 January 2010. This page wis last eeditit on 26 Mairch 2018, at 21:35.